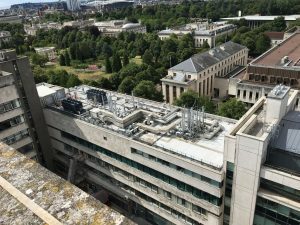 Energy services and energy performance organisation, Breathe has been awarded a £16 million energy performance contract with Cardiff University. The project, due for completion in 2021, involves an energy performance overhaul of 220,000m2 of 73 academic buildings at the university, including a £5 million tower block fabric upgrade. The project is underpinned by Cardiff University’s commitment to improving the energy efficiency across its estate and is being funded by the Welsh Government Green Growth Fund through an interest free loan. The projects for consideration include: LED lighting & controls retrofit; combined heat and power (CHP) plant installation; private wire network and smart grid management; distributed heat network; ground source heat pumps; solar PV; HVAC upgrades; water supply bore hole; systems recommissioning for operations and maintenance upgrading; BMS upgrades & consolidation. These are expected to provide £1.6 million annual savings for the University. Deputy Vice-Chancellor of Cardiff University, Professor Karen Holford said: “As part of our biggest campus upgrade in a generation, we are improving the energy efficiency of our existing estate through a number of innovative and sustainable initiatives.